We were teased. Teased by pleasant weather, by the tiny, pointy buds resting on the trees and the brilliant yellow daffodils, which magically emerged from the earth. Spring was surely on its way. Then, surprisingly, I woke up last Monday morning to a wonderful, winter wonderland. Slightly muddled but still enchanted by the snowy spectacle, Michael and I grabbed our coats and boots we had hastily stashed away in the back of the closet and set out on our last possible snow day of the year. We took a stroll, arm in arm, through sleepy downtown Franklin and wandered closer to one of our most beloved spots, the beautiful and historic Carnton Plantation. The Carnton Plantation became famous during the Civil War for reasons I will lovingly spare you from. We slowly trekked the frozen ground, taking in the stillness of the landscape. Vibrant daffodils stared at us with their luminous, trumpet faces, reminding me to cherish this passing winter’s day. The only sounds on the estate were the crunching of my black wellies underfoot and the soft, trickle of snow falling to the ground. Everything was still. It gave me a chill how eerie the plantation grounds felt. Here, on the same land where many men fought on crimson soil, we stand in bliss over a blanket of white snow. After rambling through the main manor, we made our way to the back of the grounds where a secret, swampy area teems with life. We spotted a family of mallards having a morning swim, each of them taking turns ducking under the glassy surface, only to have beads of water swiftly glide off their backs. Fog slowly crept across the water like a fold of delicate tulle gently, slowly unraveling from its seams. Flotsam from an old, cockeyed structure in the swamp jarringly thumped against the side of the building, waking us from our wintery daydream. We ran back to the car with stiff, frozen limbs and glided away. I sat there thinking of winter and hoping this was its farewell finale. If this was winter’s way of saying goodbye, then I believe the occasion calls for creating something special with the rest of the lovely pecans I’d been hoarding. This pecan and chicory cream is earthy and slightly surreptitious in nature, just like our winter spectacle. Hopefully I’ve taken off my heavy coat for the last time this season. Until next time dear winter…it’s been grand. 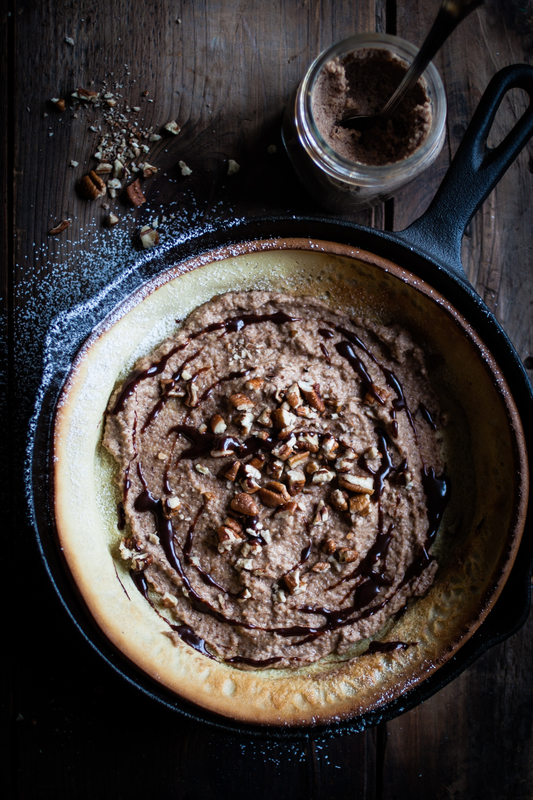 Note: Pecan & Chicory Cream can be covered on toast, cake or spread across the top of a Dutch Baby (recipe below) sprinkled with pecans, powdered sugar and melted chocolate! Place all of the ingredients in a saucepan. Boil for 10 minutes on medium low heat, stirring occasionally. Keep an eye on the cream so it doesn’t boil over. Take off the heat and place in a blender and blend until smooth, adding more whipping cream if needed. The texture you are looking for is a smooth paste. The pecan cream should have grain but it should be spreadable. Keep chilled until ready to use. Note: You can also make the batter ahead of time for a speedy breakfast. Just blend the ingredients together and stash the batter in the fridge overnight. Continue with the rest of the recipe as follows. Combine all of the ingredients with the exception of butter in a blender and blend until smooth. Set aside. Once the oven has preheated, place the butter in a 10-inch skillet and place in the oven until all the butter has completely melted (this will only take a few mintues.) Take the skillet out of the oven and brush the melted butter up the sides of the skillet. Pour the batter into the buttered skillet and immediately return it to the oven. Bake for 15 minutes or until the edges are golden. Enjoy! That is seriously absolutely fantastic! Your photography always tells me such lovely stories through each image. Thanks so much! You are too sweet. I loved capturing this day and being able to share it with y’all! Thank you dear! I’ve made this Dutch Baby so many times and it always comes out absolutely perfect. Downtown Franklin is lovely! It’s a wonderful place to call home. This looks so amazing, and on a dutch baby. Your pics are so nice, the lighting everything, perfect. Thank you so much for the kind words! It was easy to make this Dutch Baby look pretty! Ah, snow! It has been quite some time since I’ve seen that pale friend. We don’t get it much/ever in southern California, but we got it a couple times a year back up in Oregon and I always cherished those few and far between snow days. But I could see how it would be tiresome for people who get it for months on end far north, I can only stay inside for so long without going a little stir crazy. It’s great you guys got to go out and enjoy it 🙂 I love the strange flat silence that snow brings the outdoors, like it’s acting as a giant sound pad, removing all the echoes of everything. So weirdly pleasing. You are so sweet (and so talented as well)! We don’t get a ton of snow here in the Nashville area, but I’m from Louisiana originally, so any snow is a big deal to me! And I completely agree with you on how snow changes the environment, creating an odd but wonderful stillness over the earth. Thanks for stopping by! I am so confused….how do I sign up to receive your posts? By the way, I am too a Southern gal by way of Crowley, Louisiana now living in Dallas. So sorry for the confusion! There is a small, gray box in the bottom right corner that says, “Follow.” Just type your email address into that box and you will receive a confirmation email. Then, you are all set! By the way, I lived in Dallas too for a short time! I was able to enjoy some really great barbecue and experience the Western culture while I was out there! Please let me know if you have anymore trouble! The BEST breakfast! I love making these beauties.